January 16, 2013  JPMorgan Chase says its profits were up 53 percent in 2012's fourth quarter — but CEO Jamie Dimon's salary will be cut in half, after the bank lost billions of dollars on risky bets placed by a single trader. Dimon's salary now stands at $11.5 million. 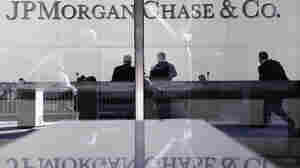 October 28, 2011  JPMorgan Chase tested charging in two states for eight months, but heard loud complaints from customers. Bank of America, which introduced a $5 monthly charge, has been assailed by many including President Obama. March 17, 2008  Bye, bye, Bear Stearns. Hello, bear market.